1. Heat the oil in a large sauté pan. Dust the chicken pieces with the seasoned flour, and fry until golden on all sides. Then remove the chicken from the pan and set aside. Add the pancetta to the pan, and fry until crispy and golden. Remove and set aside. Then add the onions to the pan, and cook gently for 10 minutes until soft and golden. Add the garlic in the last few minutes. 2. Return the chicken and pancetta to the pan, along with any juices. Pour over the wine and chicken stock, add the herbs, and bring to a gentle simmer. Cover partially with a pan lid. 3. Meanwhile, melt the butter in a small frying pan, and gently fry the shallots until golden. Remove them and add them to the sauté pan with the chicken. Then repeat with the mushrooms. Cover with the lid, and gently simmer for 40 minutes until the chicken is tender, thoroughly cooked with no pink meat and the juices run clear. Remove the thyme and bay leaves. 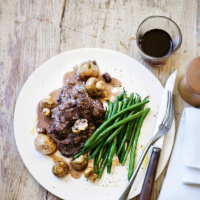 Serve the coq au vin with plenty of smooth creamy mash and steamed green beans. This recipe was first published in Thu Sep 08 10:17:00 BST 2016.